As the temperatures rise, I want to stay in the shade. Shade is a wonderful thing in Florida gardens because of the cooling relief it brings from the hot sun. But gardening in the shade is a bit different than when full or part sun is available. Shade brings with it a set of gardening challenges. The plant pallet is different and can be very green. To get variety, you may need to vary the texture and shades of green or look for variegated foliage. But first we need to be aware of the different kinds of shade. The shade of a house facing west is only temporary and the blazing evening sun comes in as the afternoon progresses. Look at the shade patterns carefully before you decide on the types of plants you need. Partial shade has at least a few hours of direct sunlight, light shade will have bright light but little direct sunlight, full shade is constant throughout the day all year long. There is also the dense or problem heavy shade under dense leaved trees. This can be the most challenging. Plants that prefer full sun will grow spindly and/or bloom poorly in the shade. Grass is also a challenge to grow in the shade, so ground covers provide a better alternative. You may have more slugs and snails in shade gardens. Also, you need to provide for good air circulation, since fungus diseases can be more of a problem in the damp shade, so give plants plenty of breathing room. There are some advantages to shade as well. Shade gardens usually need less care. The soil dries out more slowly so less irrigation is needed. If it is under a tree, the leaves dropping can just be left for mulch thus leading to richer soil. If you do have grass in shady areas, let it grow taller and mow it less often. One big advantage of shade trees is that the shade they produce can lower air conditioning loads and your electric bill. 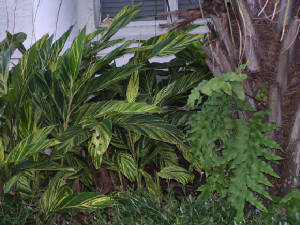 A number of plants are particularly adapted to thrive in the shade. Some understory plants for partial shade include copper leaf, camellia, European fan palm, firebush, hollies, pittosporum, Indian hawthorn and ajuga ground cover. Plants for full shade include azalea, viburnum, ligustrum, cast iron plant, bromeliads, cardboard palm, nearly all ferns, ivies, Asiatic jasmine, mondo grass, and podocarpus. There are some flowering plants that thrive in partial to full shade; oak leaf hydrangea, many clerodendrums, Florida anise, rouge plant, and wild coffee. Both impatiens and begonias are great for flower color, as well as gingers, Nun’s orchid, and in our winter – pansies. Impatiens and begonias are better grown in containers since they prefer more water. 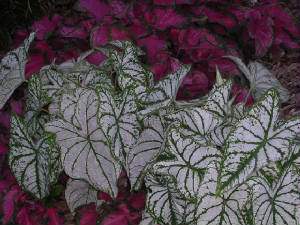 Caladiums and coleus do not provide colorful blooms, but their leaves are very colorful during the summer months. And, if you like growing orchids, they can hang from the branches in the shade that trees provide. 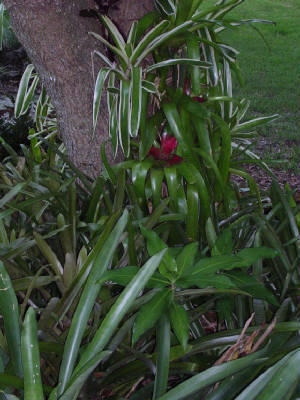 Ferns, ivy and many bromeliads are good choices for that heavy problem shade. Consider livening up a shady spot in your yard. It will be a cooler job than being out in the sun this time of year.